While the lives of UK citizens in the EU remain in limbo, ease their anxiety and show them that they are not alone. Show your solidarity with Britons in the EU and #AdoptaBrit. Show your friends, neighbours, colleagues, team mates that they are not alone. You recognise their right to live, work and study in your country and you support their right to equal rights. 1) Take a selfie or ask a friend to take a photo that shows you with your British buddy. Remember to tell us who is in the photo (first names only), where the photo was taken, what you do for a living the nationality of the person/people in the photo, and their relationship with you. Encourage your friends and contacts to do the same! The lives of Britons in the EU remain in limbo. While some governments (the Netherlands, Luxembourg, Germany, Italy, Ireland) have given reassurances to their British community, allowing them to remain in the event of a no deal, many EU27 state are yet to confirm the rights of Britons living in their country in the event of a no deal. The #AdoptaBrit campaign shines a light on the realities of people’s European lives. 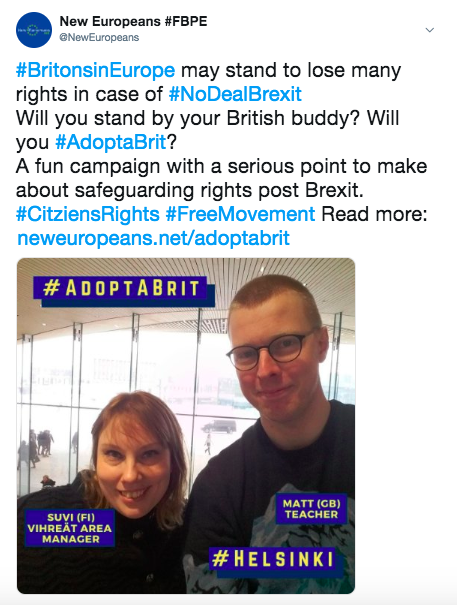 This is a grass-roots project - getting ordinary EU citizens thinking about the ordinary British people they live, work and play with. It is about empathy. It is about solidarity. And it is about making connections. Whatever the outcome of Brexit – deal, no deal, no Brexit - the relationship between Brits in the EU and 'home' and their 'hosts' will be changed forever. Show solidarity with UK citizens in the EU and help the citizens of Europe understand the Brits living amongst them. New Europeans has worked continuously both night and day since the referendum to defend the rights of #the5million #Eu27citizens in the UK and #BritonsinEurope. We have always campaigned for immediate, comprehensive, unilateral guarantees because we believe it is wrong to treat human beings as bargaining chips and we always feared that there would in the end be no deal despite the negotiations. In a no deal scenario, EU27citizens in the UK will have their rights protect unilaterally. However, the EU has said that the rights of Britons in Europe would need to be protected through individual agreements with each of the EU's member states. That is why this aspect of our campaign is focussed on Britons in Europe - to secure their right to stay in a no deal scenario. We continue to fight for the status and rights of EU27 citizens in the UK and Britons in Europe to be ring-fenced by means of an #EUGreenCard.